Do you love summer grilling? If you’re like me, nothing beats a lazy backyard BBQ with friends, and these burgers are sure to impress your guests! They are simple to make, but delicious enough for any restaurant menu. When we tried our first stuffed burgers last summer, we knew we were on to something, and I’ve been dying to try more variations of this fun meal. 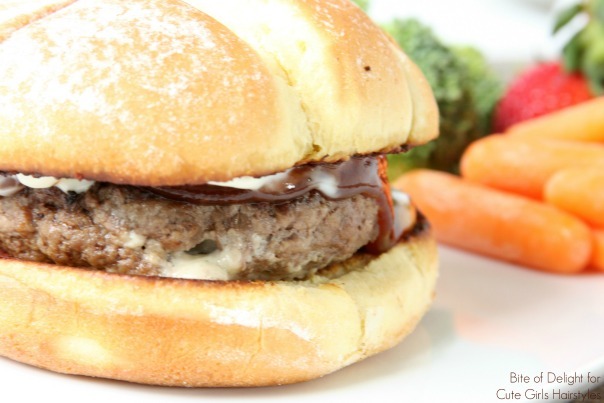 Stuffing the toppings inside the meat is a great way to serve these flavorful burgers. You can add a variety of toppings, but we love this creamy blue cheese and bacon combination. Don’t forget your favorite BBQ sauce, it’s a perfect combination of flavors! Be sure to seal the edges well, or some of your filling will ooze out once it begins to melt. Sprinkle with salt and pepper once the patties are formed, your meat will be more tender than if you mix it in. Combine the cream cheese, blue cheese and garlic. Set aside. Divide meat into fourths. Now divide each fourth in half (for 8 total pieces of meat). Shape each section of meat into a round patty, slightly bigger than your hamburger buns (the meat will shrink as it cooks). Drop 1/4 of the cheese mixture onto each of 4 of the patties. Spread the cheese mixture to within half an inch of the edge of the patties. Cover the cheese with bacon crumbles, dividing it evenly among the patties. Top the blue bacon patty with the plain patty, and seal the edges together. Sprinkle with salt and pepper. Cook patties over a medium-high grill for 3-4 minutes on each side, or until cooked through. 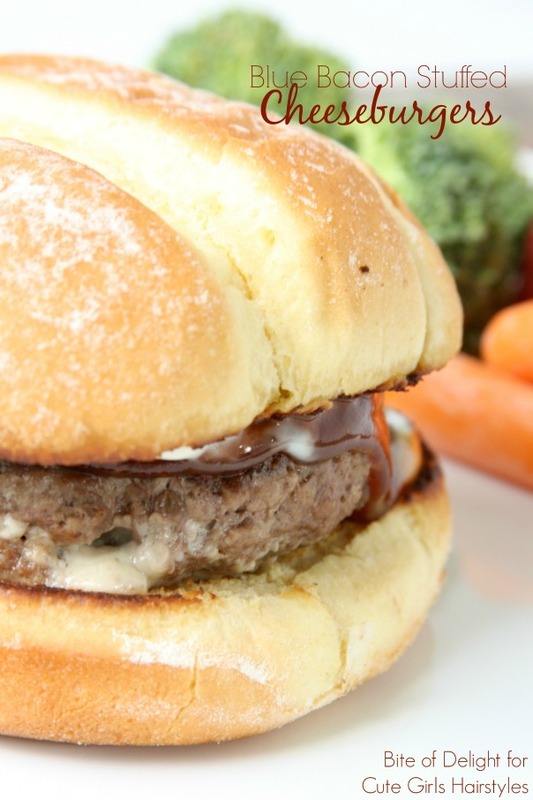 Let burgers rest for several minutes before serving with mayo and bbq sauce on toasted buns. If blue cheese flavor is a little strong for you, add 1 oz to the cream cheese mixture. If you love blue cheese, add the full 2 oz. If you have fresh garlic, use about 1/2 clove…or more to taste! You can make it without the cream cheese, but we love the creamy, gooey melty cheese center, so we always put it in. Use 85% lean meat. If you use leaner meat, it will less flavorful. Try to work the meat as little as possible. 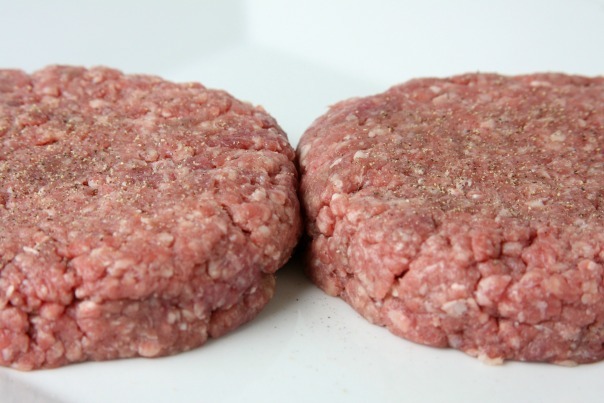 Stuffed burgers require more handling than a plain patty, so just do your best not to overwork it. Shape your patties to be a little larger than your hamburger buns. They will shrink as the fat cooks out. Season your patties with salt after the patties are formed. Your meat will be more tender if the salt is not mixed in. Grill your hamburgers for great flavor. Cook them under a broiler in a cast-iron skillet if you can’t grill them. Toast your hamburger buns. Open the buns and face them inside-down on your cooking surface until they are lightly browned (or face them up if using a broiler). 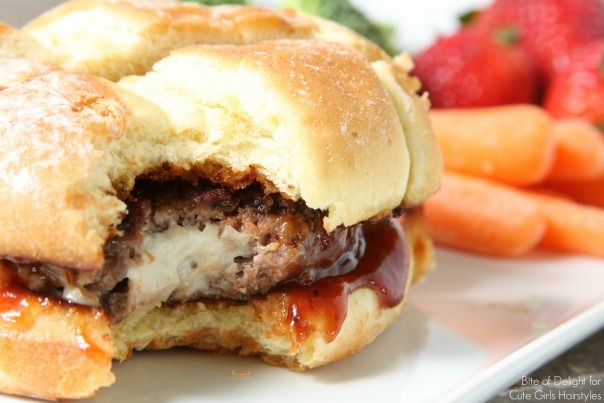 Let your stuffed burgers rest for a few minutes before you eat them. The filling will be hot and melted and may ooze out, be careful not to burn yourself.